| #7 | Forward GET MORE STATS! Carl Landry began his Purdue career under the legendary Gene Keady and was the centerpiece in the Boilers resurgence to regaining their elite status. During Carl's career at Purdue, 2004-2007, Carl epitomized the Boilermaker spirit and winning attitude. While at Purdue, Carl was a 2-Time All Big Ten Team member, 4-Time Big Ten Player of the Week and led the Boilers to the second round of the 2007 NCAA Tournament, Purdue's first NCAA Tournament appearance since 2003. After Carl's outstanding senior season at Purdue he was selected by the Houston Rockets with the 31st Pick of the 2007 NBA Draft, the highest Purdue draft pick since Purdue great, Glenn Robinson. 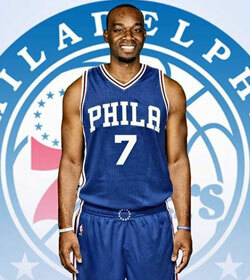 Carl also earned 2007-08 NBA All-Rookie Team honors and played a major role in the NBA playoffs as a rookie. In his third NBA season, Carl enjoyed his best year as a pro. He was an early favorite for the NBA Sixth Man of the Year Award with the Houston Rockets before being traded to the Sacramento Kings to bring a low post scoring presence as a starter in the NBA. In his new starting role, Carl has helped the Kings become a playoff contender in the NBA Western Conference and has become the focal point of opposing NBA defenses every night.